If you want help to plan an Architecture trip to Tokyo, please contact by e-mail. Everything below is old information. Walking and cycling tours focused on Architecture and the urban landscape of Tokyo. 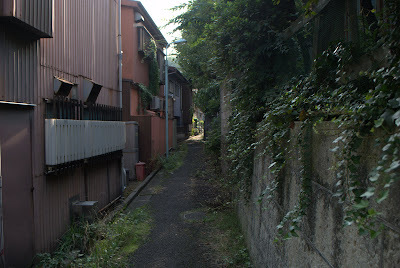 An unused path in a dense area in Meguro-ku. Enjoy the feeling of being slightly lost, to find new spaces, new routes, new areas: the joy of seeing the city from a bicycle. A continuos view of the condition of the city. The tours give you a view of special morphological features of Tokyo as well as buildings and houses that are relevant to visit in the given area. The tours are mainly for people interested in architecture and/or want to see the city in a new way. Together with maps and brief explanations, the city will become easier to understand and navigate, as well as more remarkable and fantastic. For practical reasons, the maximum number of persons is 10. To reserve a spot see below. All tours will be given at pace comfortable to participants, the pace is quite relaxed, suited for the back streets used for navigating the city. Bicycle required. If you don't have a bicycle, you can rent it from places like Tokyo Rent a Bike in Nakameguro (I'm not affiliated with them in any way, but can make the reservations). After the tour there will be time for coffee and discussion or questions if anybody wants. Why are the streets of Tokyo intresting? From Tenunobu Fujimori et al's, "Institute of Street Observation" we discovered the joy of actually walking the street and finding fragments – allowing the swelling of imaginations and the speaking of small urban histories. Contemporary Tokyo’s situation is a crazy mixture of main-products and by-products of modernisation. Tokyo is an agglomeration of buildings, traffic infrastructure, civil engineering. Its landscape is said to lack visual control and is popularly thought of as chaotic or as 'white noise'. However, this kind of interpretation is based of mechanistic theory and semiotic systems. So, if we change the premise, a totally different interpretation of the city should be possible. Made in Tokyo - Introduction. His tours combine visits to notable contemporary buildings, and a broad understanding of Tokyo’s history, topography, planning, edges, forgotten spaces, and endless complexity. It was simply amazing. We see the city in a whole new way now. I want to go biking with Linus every weekend now. I've left Tokyo 2 weeks earlier than planned. Tthere are no more tours. A Shotengai, the typical suburban shopping street. Here Soshigaya-Okura. View from the Tokyo Metropolitan Government Building in Shinjuku towards Setagaya-ku.